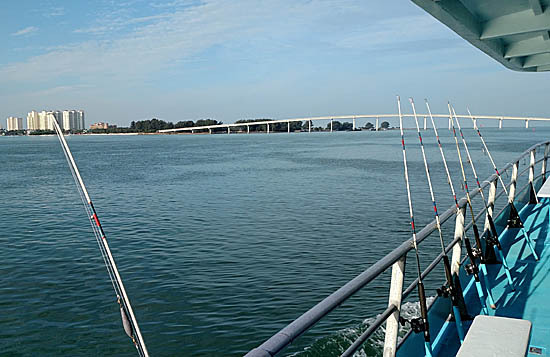 CLEARWATER, FL – The second day of fishing I decided I would do a headboat. I’m very familiar with this type of fishing as we have a good number of them on Lake Erie that run out of Port Clinton, OH. I used to live in Port Clinton and would go out a few times a year. Historically, I have not done well on headboats but I had a host of reasons that made this the correct choice. One big factor was knowing I wanted to get out on a boat, but with a forecast that was calling for some bad weather, did not want to lose the substantial cost for a private charter if we had to come in early. A big boat could handle the weather and I knew we would not likely quit because of conditions. I also liked the idea of a more ‘deep sea’ type experience. The attendant was very friendly when I arrived and the weather was looking surprisingly good. I did the typical headboat ritual of selecting a ‘lucky’ position on the boat and examining the loaner rod. Once the rod checked out, and it actually was quite nice quality, I moved to the secondary things all people on headboats do… look at the other anglers. While no one admits it, everyone guesses who the ‘pro’ will be catching all the fish and who the unfortunate soul will be that spends the day re-rigging after getting snagged or untying from tangles with other anglers. I enjoyed the ride out into the Gulf, taking in the skyline, and being the typical tourist shooting photos of anything and everything common to the locals. It was great that there was another person on the boat that was solo, Scott, who happened to locate me. He would end up providing a lot of great conversation and became a good friend for the day. When we arrived to the first stop and the Captain announced we could put our lines in, it was a relief to know I had someone willing to snap a photo or two should I catch fish. Now I just needed to make that happen. The day started very slow for me, our first stop was dominated by my new friend Scott two feet away from me reeling in fish after fish while I watched. 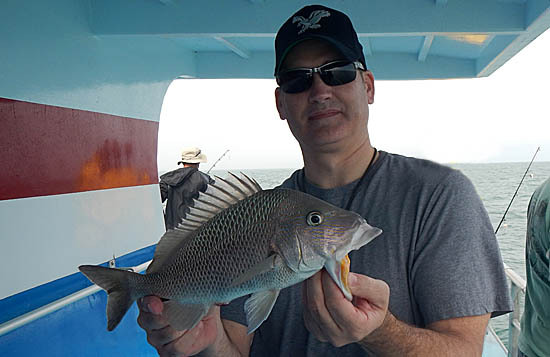 The bite was fair for the boat in general, with many White Grunt being caught and an occasional Porgy. If I wasn’t watching Scott bring in a fish, I was watching a few dolphins around the boat, as my rod sat idle. I finally got my first solid strike, right as the Captain called for the lines to come in for our first move. After a short motoring of 5-10 minutes, we were anchored and ready to resume fishing again. With renewed confidence after getting a bite, I suspected my fortune would change. It didn’t take long and I was fighting my first fish, a nice sized White Grunt. It seemed that getting the first was the trick because after the initial catch, the fish came easier. I may have been the last one on the boat to get my first fish, but the third White Grunt I caught was one of the largest, if not the largest, that would be caught by anyone that day. I could tell the regulars don’t value the White Grunt that much, but I was still happy with the big one and all the subsequent ones I was catching. The First Mate was also plenty happy to have me giving him all my fish. I picked a good person to befriend as Scott was the first person to catch a Grouper, a decent Gag but well short of legal size. He caught several short fish while I continued to catch White Grunt with no other species mixed in. I may have been outpacing anyone on the boat with the White Grunt, but was hoping to catch some other types of fish. I saw a few Black Sea Bass and a single Lizardfish and Flounder get caught, while I remained catching a single species. The boat made a few more moves and everything remained pretty similar. 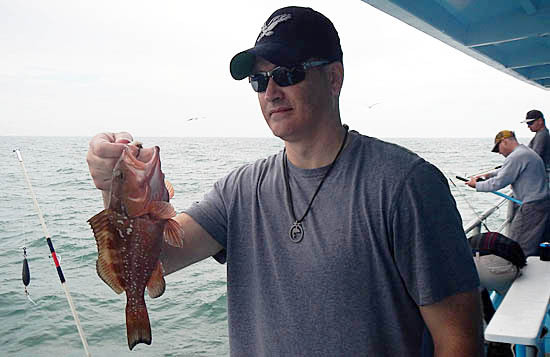 It was Scott who finally managed a bigger bite, which turned out to be a beautiful Red Grouper that was just shy of 20″. Still not a keeper, but the biggest fish the boat had seen. Scott followed up with several more Grouper, all Gag’s that were much smaller than his near keeper. I finally managed something other than a Grunt, a small Red Grouper. Not the monster I had hoped for, but something new. 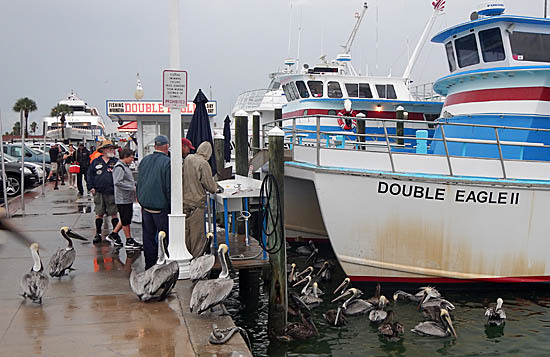 The weather did turn for the worse, but we were able to fish for the entire planned duration. I was pleased with the charter as the Captain moved plenty to try to help the anglers get on better/different fish. The reality was that we were put on fish and everyone caught, on a headboat that is as much as you can ask. Of course we all wished and hoped for a big fish or something special, but fishing is fishing and it doesn’t always work out that way. 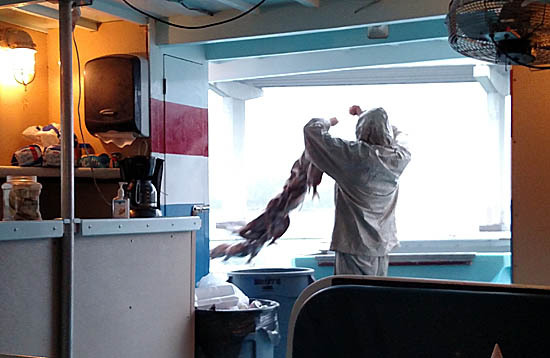 I also should mention the First Mate worked hard and was very helpful, as was the gentleman manning the galley who was quick to fill orders of snack, food, or beverage. I would recommend this charter and would go out with them again without hesitation. After two packed days of fishing I was still going strong. Michael and I continued our tradition of finding some good food for the evening, this time opting for The Lucky Dill. I was sad thinking this was my last night in Florida already, but admittedly was missing the wife and kids. I woke up early the next day and realized there was a small window of time to do some shore fishing before heading to the airport. No time to scout new water, just an hour or two to fish around the Seminole Street Boat Launch like I had done on the first morning. This time the Blue Shark Bait Shop was open, and I was given some tips and pointers for Redfish and Sea Trout. After a colorful conversation and realizing I had much lower expectations then what he wanted me to catch – I left with a newly purchased tandem rig with two jigs that is popular down there. Walking across the parking lot I noticed a cool looking wrapped vehicle, which I had to get a closer look at. The photo above tells the story, too bad I couldn’t have gone out fishing with him! Not only would that have made for an epic story, imagine the fish that would have been caught! After snapping out of my daydream of Capt. Ray becoming my new best friend and traveling the country fishing together, I realized I needed to fish with the little precious time I had left. As I returned to fishing, I had the typical small fish nipping at the little jigs I was throwing, with a few Pinfish being landed. I lost another fish to an Egret of some type and feared that would be my last fishing memory of the trip. Fate was kind though, and another small fish was landed. I took note that it looked different than anything I had caught in the previous two days and fortunately decided to take a couple of photos. 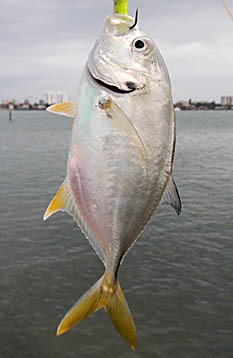 I sent a photo to Ryan who confirmed it was a Jack Crevalle, the 15th new species for the trip! While this and many of the species I caught can get much larger, just getting them on my life list was enough for me! I could ramble on and on about how much I loved Florida, the fishing, and the trip, but hopefully the length of the two posts make it obvious. I can not wait to return and continue the adventure, there are so many more species waiting to be caught! I also know I will plan to chase some of the popular sportfish that I did not target this time! 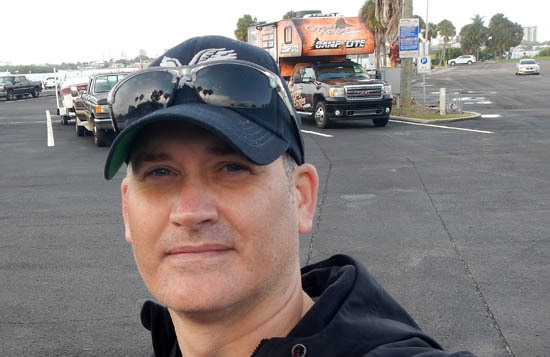 To read “Florida fishing trip to start the year! (Part 1), click here.